1/2” 3 tpi is a good general purpose blade. Biggest blade that I use on my Grizz G0555LX. Then 3/8” 6 tpi, and 1/4” 8 tpi. Those 3 will do most of what I need. Carbon steel flex back 3TPI hook set blade pretty common for woodturners. If want less expensive blades check these folks out. Lot of woodworkers prefer these blades over Timber Wolf for longevity. If hung up on Timber Wolf they recomment raker set blades for cutting green wood. JMHO, carbide tip blades on a 14” bandsaw not worth the money, if have a larger saw they are great. What is the size reasoning behind your opinion? There was more to the comment…must have been a PEBCAK error. I had put a grinning emoji there where it cut off the text, oh well. I’m curious why it is a waste of money to put a carbide blade on a 14 inch saw? It works well, doesn’t seem to drift and for my wife’s turnings she gets almost a perfectly circular cut for blanks. My wife went through a couple blades a year, so if it lasts 2 years it is worth it in my opinion. The cuts look like they were jointed they are so smooth. We do have the riser, so we can use the full capacity of the saw. Wisdom once was carbide BS blades to stiff to run on 14” saw due to (0.35) thickness of blades. Well that has change with just carbide tip blades like Lenox 0.025 thick blades. Only down side to new 0.025 thick carbide tip blades are their price. If do a lot of re-sawing and have the money buy one and don’t look back. On the other hand flex back blades with any alternite, hook, or raker set will serve you well for the price. For re-sawing logs for turning blanks helps to have a BS sled. I found free hand or circle jig for getting blanks round a breeze. Never went smaller than 3 TPI blades though. I’ve only used a carbide tipped blade, didn’t know there was any other kind. I can only say it is worth it to us. If it lasts 2 years it pays for itself. I have carbide on my TS, Jointer, and Planer, so it seems natural. Based on cost the BS blade is second cheapest. Good TS blades blades approach $100 and go way up, the BS blade was $149, Carbide head for 12 inch planer/jointer is very expensive. There are pretty cheap BS blades, but carbide is much better IMHO. 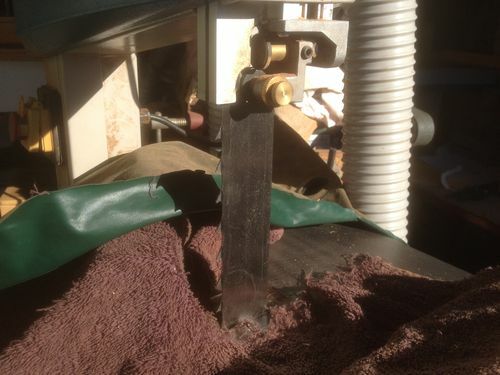 A blade used to cut green wood, requires a lot of gullet to effectively clear damp sawdust A carbide tipped blade would be great, but any good 1/2”, 3TPI blade will do the job. I personally use Starrett, “Woodpecker” blades; their weld is invisible. Lenox also makes a good blade. I have not tried a Timber wolf, but I hear many are happy with them. I’m not a turner, I’m an enabler. We purchased a band saw for my wife to trim wood. We tried various sizes up to 3/4 inch. Eventually found the 1/2 was best. Often you need to trim off the end of a log or the end of a large piece. I’m not sure what it is called when you cut a log lenthgwise and use that as the blank. Anyway they are large pieces and the 3/8 blade could be easily disturbed. I stand to the side and support the weight, but it was easy to see the poor cuts and how the blade could wander. I’ve watched the Snodgrass videos, so I think I’m ok at adjusting the saw, not great, but ok. We tried several different blades over the years, timber wolf and Carter come to mind. 3 tpi is good for rough cutting, but the surface will need some work if it is a showside. Give it a try, perhaps we try to cut too fast. Be careful crosscutting logs, when they start spinning you will need to change your underwear. thanks, I was surprized when the recommened blade for turners was a 3/8s makes sense for bowls. i check it out further. That is probably due to the radius limit, I think with a 1/2 inch blade 5 inches is the smallest circle you can cut. We got the carter circle cutter jig and centre finder faceplate thing (it helps you put the faceplate in at the exact centre of the circle). Not at all needed, but they can help get the maximum out of your blanks. Not knowing what saw you have, most band saws of the 14” size will take a maximum of 1/2” blade Few saws of that size are able to properly tension the blade. Using a 3/8” blade will allow greater tension for a less drift cut. A lot of comments but how many apply to a 10” bandsaw? IMHO, you can not even start to properly tension a1/2” blade on that saw. I guess, I don’t think I have seen a 10 inch band saw. I used a 3/4” as that was the largest size recommended by Grizzly. Wore it out. It was pretty good, but not so good on cutting curves in the size we needed. I have a 14 ” saw with a 1 TPI which is impressive. I use a 9” Ryobi and normally run a 3/8” blade, I think it is 4 tpi. The blade is 59 1/2” diameter.